“Play That Groove” Paying Homage Grover Washington, Jr.
Grover Washington, Jr. (Born: December 12, 1943 – Died: December 17, 1999) he was a Smooth Jazz, Jazz Funk, Soul Jazz Saxophonist. He is considered by many to be one of the founders of the smooth jazz genre. He wrote some of his material and later became an arranger and producer. Throughout the 1970s and 1980s, Washington made some of the genre's most memorable hits, "Grover put across such a ... See More vibe," Jason Miles a Philadelphia Musician says enthusiastically. "He had his own sound, and he was a virtuoso on four horns. When you put on some of those albums, there's a bit of magic happening." He later had the opportunity to work with the saxophonist on several occasions, beginning with the 1987 album Strawberry Moon. Two years after Washington's untimely death, Miles released the tribute album, To Grover, With Love, followed by a sequel in 2008. Jason Miles thinks Grover Washington Jr.'s music deserves more than a "Smooth Jazz" label. 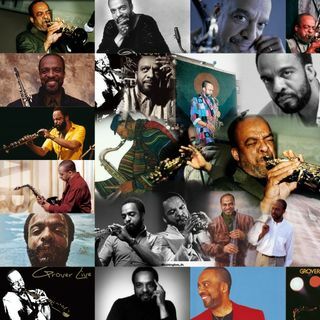 Grover Washington, Jr. his music "Flows" and is just "Everlasting".